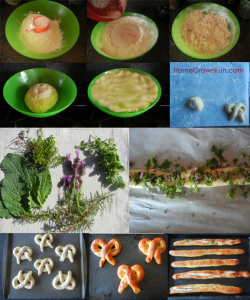 Herbs are fun to experiment with and we hit a home run with these homemade pretzels. Click here for a printable recipe using no herbs. GO AHEAD, FREEZE THE DOUGH! You can freeze or refrigerate the dough. If this recipe is too much for you, freeze a good-sized ball of dough for up to 3 months or place it in the refrigerator no more than a few days. Let frozen dough defrost in the refrigerator overnight and allow cold dough to sit for 1 hour, covered (in the same bag or container) so it can rise. Two bowls. One smaller glass, ceramic or plastic bowl for the yeast mixture and one extra large bowl for the dough. If you have a cover for the large bowl even better but not essential. INGREDIENTS NEEDED – SO SIMPLE: Yeast, flour, sugar, salt, baking soda, olive oil, butter and water. 2-3 sticks butter – salted or unsalted – just make sure it is a good quality butter. Cheap stuff tastes more like oil. DO NOT USE MARGARINE OR IMITATION BUTTERS!!! If you’ll be adding herbs, gently wash and dry your FRESH herbs. Make sure to remove woody stems. Chop the herbs up roughly. You don’t want the pieces to be too small. Keep your herbs on a paper towel until ready to incorporate into your dough. Use one or a combination of fresh herbs. We used them all on this list for several pretzels and they were our favorite. 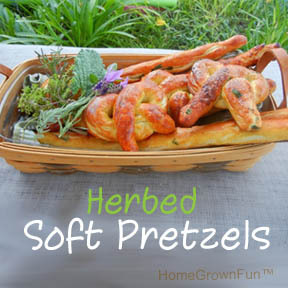 Imagine little pretzel bites with different herbs. DIVINE!!! to 2 1/2 cups. Use a thermometer to see if you are close to 110°F. If not, adjust. Once the water is AT or VERY NEAR the proper temp, pour it into a medium bowl. Immediately add the 8 teaspoons yeast. Add the 2 teaspoons sugar. Mix to merge. Let sit for 5-15 minutes while you prepare the flour. If all is well, your yeast mixture will look creamy. If not, your water temperature was off or your yeast is too old. Do not continue if nothing changed with the yeast water after 15 minutes. Fix the yeast first before incorporating into the flour mixture. Put all dry ingredients in the big bowl. Mix well by hand with the implement of your choice. Make a well in the middle of the flour. Slowly pour the yeast liquid in the well. Add the olive oil to the liquid. Start mixing with a strong paddle or thick-handled spoon. It’s ok if the dough is moist. That is better than too dry. If the dough is too dry add water in increments of only 2 tablespoons at a time. Form into a big ball and knead gracefully until fairly smooth: 5-7 minutes. Do not overwork the dough. e dough nice and puffy. Let tthe dough sit in a warm place for at least an hour. Line at least 2 baking sheets with parchment paper. I don’t grease baking sheets because it makes the pretzel bottoms too hard and greasy. Preheat the oven to 450°F (232°C). Make sure to have an oven rack in the middle. I do not bother putting the pretzel dough out on a floured surface. Doing this on a horizontal surface gives my daughter trouble because the extra flour interferes with the “snake-making process” and she tends to overwork the dough. Have kids stand up while shaping. to make a log. Keep rolling and gently stretching until it gets longer. Let gravity help you out. Don’t worry about the ends becoming thin, you can use those for pretzel bites. Once you get a 12-16 inch rope, hold both ends and twist it around a few times like a jump rope. Weeeeee! This will extend it even further and help it to hold its long shape. To make a pretzel that won’t be one big blob, make sure your dough snake is about 3/4 of an inch thick and about 24″ long. You’ll get the hang of it after a few. Feel free to adjust to make the pretzels the shape and size you want. Get creative! ress the ends onto the bottom of the “U”. Don’t worry about attaching the ends to the “U”. Somehow they stay put – just give it a gentle push without disfiguring the pretzel. The image below shows the shape but try twisting one more time in the middle. Works better. BATHE THE PRETZELS IN BAKING SODA: Place each pretzel and any sticks or bites (from small pieces of dough) on the parchment until you can dip an entire sheet in the hot baking soda bath. Once you have a sheet ready, carefully dunk one pretzel at a time in the bath for a few seconds. Use a flat spatula to enter the bath and to remove the pretzel. Place the pretzel back on the parchment until all are done and ready to cook. BEFORE COOKING, sprinkle the tops with kosher salt. Place your sheet of pretzels on the middle rack in the hot oven for 8 minutes. Take them out when they are golden brown. These brown up very quickly. You’ll peak and they’ll be just starting to brown and a minute later – they’re done. Watch and take out before you get petrified pretzels! The most surprising discovery was that the more herbs the better, even the lavender. For the last batch we combined all of the herbs together and many of our neighborhood taste testers thought those were the best. Wow! These look good…AND…easy to make! I didn’t know pretzels could be so easy, always wondered how you make them!